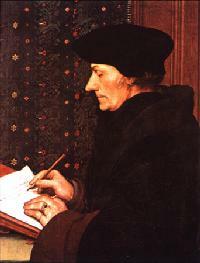 Erasmus was a scholar, innovator, reformer, and perhaps most of all, an intellectual leader. He is probably known best as the father of the Humanist movement, and for his disagreement with Luther over the reform of the Catholic Church. As a person, Erasmus was an introvert, and liked to withdraw into the seclusion of the world of books - reading, writing and printing. Intellectually he refused to take sides on any issue, preferring to remain non-committal, seeking to reconcile all viewpoints. He detested war and violence of any sort, perhaps owing to his sensitive disposition. He gained wide popularity quite early in his life for his views on the practice of the church of his time, notably the sale of indulgences and the excesses of the clergy. His strongest statement on this was The Praise of Folly, in which he was clever enough to make Folly the mouthpiece for his most invective charges. This got him off the hook as far as taking responsibility for his opinions, an important consideration during the time of the Inquisition. After all, since Folly said these things, who can take them seriously? It was a clever device, but the cleverness of The Praise of Folly goes beyond this. It bids us to enter into the ambiguity of what we can know and understand, and ultimately the ambiguity of all knowledge and wisdom. It leaves us with that sense of discomfort which is the beginning of deeper thought and reflection, in which we ask where our real security lies. In this age of transition, this book speaks to us loud and clear. It reveals to us our own excesses and discloses our false sense of security. It is thoroughly modern in the sense of questioning what we can know. The wisdom of Folly comes back to both haunt and edify us after 400 years of relative oblivion. Erasmus also bids us to set straight the historical record of the Reformation. Since the winner gets to decide what the history books say, Luther has often been the hero. From the vantage point of our own era, we can now see that Luther, the "great reformer", set us on a course far off center, and from which we are just now begining to recover. Luther's stand, as was that of the church, was rigid and inflexible. As in all situations of polarization, clarity, reason and tolerance are scarce commodities. Perhaps the church brought on this polarization with the Inquisition, its excesses, and so on. But Erasmus treaded that fine line between both extremes, and those without Erasmus' sensitivity and acumen were unable to walk this razor's edge. Luther had his own share of indulgences and excesses, and together with those of the church, these produced what we have experienced as 400 years of dissension, division, misunderstandings, rigidity, violence and the like. Erasmus kept on preaching moderation and conciliation. Unfortunately, during times of tumult, voices such as his are drowned by the clamor. In our day, we are desperately seeking a way for nations, races, religions and traditions to come to understand and cooperate with each other in such a way that respects the value and uniqueness of each constituent. We are learning to honor the contrasting and hitherto conflicting elements of unity and diversity. Erasmus' voice can provide guidance in such sensitive and potentially explosive areas. Will we listen, or will we again heed the voice of another extremist who will take us on another course far off center, from which we may perhaps not even return. Our situation is pretty delicate, with our environment steadily deteriorating, our population rising, our resources declining, and our hope dwindling. Erasmus may have answers for us, but each person must listen for himself and herself. An answer where one person does the work for another has already been tried and has been shown to bring more problems than benefits. A significant fork in the road that caused much fragmentation in our way of being, as a whole happened at the time of Luther and Erasmus. We might want to consider the feasability of going back to that fork and choosing the one road less traveled. What do you think? If you also feel that dialogue is a road to clarity, truth and wholeness, send me an email and we can travel a stretch of that road together. Last revised: June 20, 2001. Last revised: March 18, 2003.